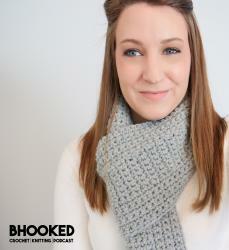 In this episode of B.hooked Knitting, I’ll be teaching you how to knit the 2×1 rib stitch. There are many different types of ribbing in the world of knitting but this one is one of my favorites. It’s versatile and easy to knit. The 2×1 rib stitch is really great for banding projects like hats or clothing. It creates a very stretchy fabric that will conform to the person wearing it. Now with that out of the way, the seed stitch will allow you to practice your knitting purling skills. This beautiful stitch is the result of knitting the purls and purling the knits. It creates a nice dense fabric with a lot of stretch. Depending on the yarn and needle sized used, you can do so many things with the seed stitch. The 2×1 rib stitch is perfect for reviewing your skills of “reading your knitting” and recognizing knits and purls as they are on your needles. In this tutorial, we’re going to work up a test swatch. You will only need 15-20 yards of yarn to get the hang of it. Any yarn in your stash will do and a pair of coordinating knitting needles. Disclosure: Please note that the links below are affiliate links, and at no additional cost to you, I will earn a commission if you decide to purchase your supplies online. Please understand that I have experience with these products and I recommend them because they are optimal for this pattern, not because of the small commissions I make if you decide to buy them online. If you have received valuable information from me at any point, this is one easy way to say thank you for a job well done. Row 1: k2, p1. Rep to end of row. Row 2: p2, k1. Rep to end of row. Repeat rows one and two until your project reaches desired length.